I finally uploaded a new video...sorry it's been a while, but i'm back!. I decided to do this video on Graftobian foundation and skin products because I already highlighted some of the eyeshadow and other makeup products in my last entry. I wanted to dedicate an entire post to the skin and foundation products because they're just that awesome. In my posts I try to be completely unbiased and give you a detailed opinion about the product, performance and price....that way you can see if you want to invest in the product. FYI, another long post, lol! 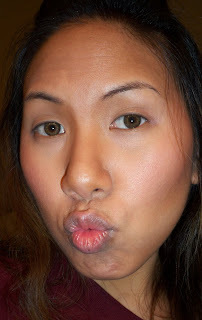 Check out my foundation/contouring video using Graftobian Products. Very helpful for learning to contour with cream products. 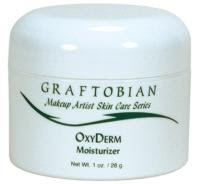 In my tutorial, I started with priming and moisturizing my face with Graftobian Oxyderm moisturizer. If any of you are familiar with the famed makeup Artist KJ Bennett (he is the head MUA for Makeup Forever) he mentions this moisturizer as one of his fav in his unbiased kit website . It doesn't break me out at all, and it reminds me of my beloved Cetaphil moisturizer except not as greasy and it absorbs more easily into the skin. Best of all, my sensitive skin had no reactions to it...that's a plus! This is definitely a great addition to your kit or own skincare regimen. The price is pretty comparable to most good quality, department store brands. Next, I corrected my undereye circles using the light orange color the left. It helps to cancel out the dark blue/green under my skin. The colors in this palette correct different skin conditions/discolorations. For example, the yellow cancels out purple undereye circles, the green cancels out redness like rosacea, and the light pink acts as a highlight color. This is a MUST HAVE for a makeup artist's kit. 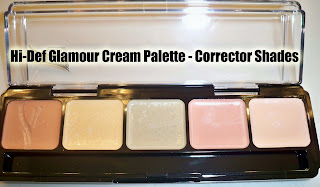 I haven't seen many palettes that have all the basic corrector colors like this. The price is very affordable at $21.99 (less than MUFE concealer palettes) or you can get each color individually for only $7.99. That's a great deal for those who want to buy a corrector on their own for their personal use. Next, I used the Super Cream Palette to apply foundation. I picked a color to match my skin tone and scooped a pea size drop onto my Graftobian steel palette. I then mixed it with my Oxyderm moisturizer to thin out the consistency and sheer out coverage. I applied it to areas of my place where I wanted to highlight my features. 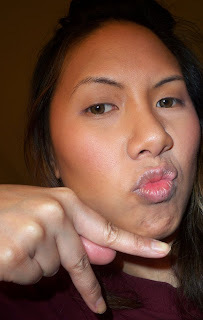 Next, I took a shade 2-3 shades darker and applied it onto my face in the contour areas (i.e. sides of nose, hollows of cheek bones). I then used a damp sponge to blend it out. This is how the celebrities get contoured...think Tyra, Oprah, and Monique. I get a lot of questions about foundation palette recommendations for a kit. I used to recommend RCMA KO and Shinto palettes because of the great amount of colors in one palettte. However, I found RCMA a lot dryer and denser. You HAVE to use their foundation thinner with it. It has a lot of colors, which is why I recommended it, but it was hard to use. The Graftobian palette is the best of both worlds. A lot of convenient colors in one case, and super easy to blend! I definitely recommend this for other makeup artists. 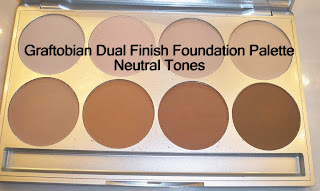 They also have a cool tones palette and neutral tones palette which I intend on adding to my kit as well! 18 foundation shades for $64.99...that's about $3.61 per color...can't beat that! Each foundation well will also last you a super long time since they're so concentrated and pigmented. Afterwards, I used the Dual Foundation palette to set the foundation. I used a mix of the lighter tones to highlight and then moved to the darker tones to enhance the contour colors. This palette is a life saver if you accidentally miss the mark on matching foundation...if you go too light, just sweep a powder brush over a tanner shade and you can correct any mistakes immediately. It's also great to have as a powder foundation for men, children, or those who don't need a lot of coverage. I don't know what I'd do without this in my kit. For $79.99 you can get the pre-filled palette...or you can order it individually at $8.50 for each full sized pan. Seriously though, $8.50 for this amazing foundation? You really can't beat that. To add the finishing touch I used the Graftobian blush in Shiny Penny. This is a reddish orange color with gold shimmers. Talk about pigmented! I talked about this a little bit in my last review but I'm telling you....this is amazing. I use it with a fan brush to apply subtle color but this will work on the lightest to darkest skin tones, hands down. Now onto pics of my newly concealed, corrected, higlighted, contoured, and blushed face! Make sure to check out the products at Graftobian.com or Camera Ready Cosmetics. I am so glad you did a post on this because I am going to the Makeup Show next week and was going to purchase the RMCA palette, but I think I am going to get this one, this time around I am going to purchase more stuff for my kit, that way I have a range of colors. I luv ya girl, you give such good advice and recommendations. I hope you feel better, allergies are the worst. This line looks so good, thanks for the review. I loved your contouring, it ws amazing. Ren, I apologize if I missed this in one of your posts or vids but is this suggested for daily wear? Or is really for use with bright lights/cameras? hey it's vyvian, just wanna say thanks again! tysh: yay glad to help!